Once your guests have had their fill of your Wedding Banquet, it’s time for the soiree. For your evening wedding party, use the wooden dance floor in the 'Music Room' for your disco. 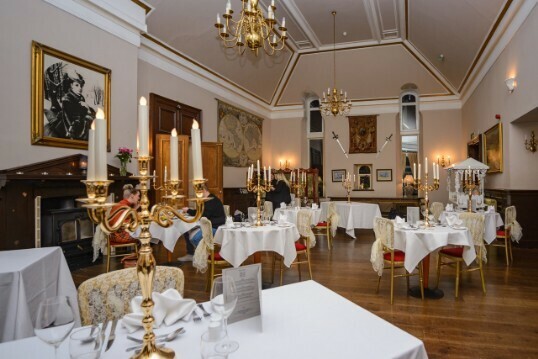 The 'Billiard Room' links to the Music Room, offering a large function room holding 150. Our function room is dressed with Louis XIV style furniture fit for the most illustrious guests, including a grand Louis XIV dining table. The main 'Patti Bar', in the centre of Castle, serves both function rooms and is exclusively yours for your wedding in Wales, along with the Nicolini lounge. 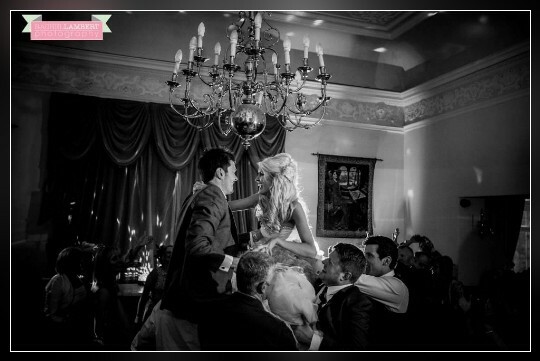 Guests can circulate freely between all four rooms or gather in the Function Room for the disco. For your disco, tables are rearranged to create a large dance floor. Bar stays open late. Evening Buffet is served either from a carvery style serving station or from the grand Dining Table. We’ll set the room out however you’d like. Whether you’re intending on laying an under-lit dance floor for your guests to dance the night away, or if you have a large evening list and need a complex seating plan, we’ll accommodate your personal requests. 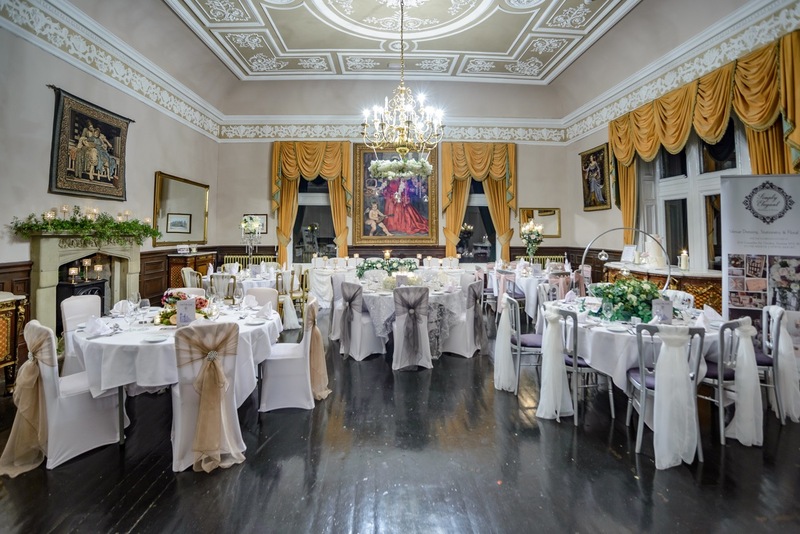 The castle ground floor offers the largest floor space of any wedding venue in South Wales, so we certainly have the space for large evening parties. 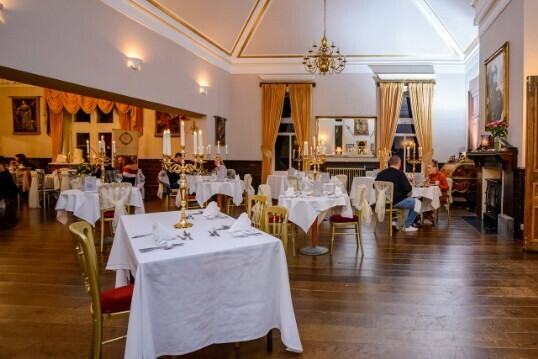 The function room seats 150 - but you can have up to 200 for evening wedding parties / discos as guests will spread out to the Patti Bar & Nicolini Lounge. Located well away from the main atrium en-suite rooms and the conservatory, our evening function room provides privacy from other areas of the castle and is well sound-proofed. Should you wish to party into the small hours of the morning, this won’t disturb those of your guests wishing to retire early. When all your guests are staying overnight, the Bar can stay open and the Evening Entertainment can continue late. The bar stays open as long as you and your guests wish to buy drinks at the bar. 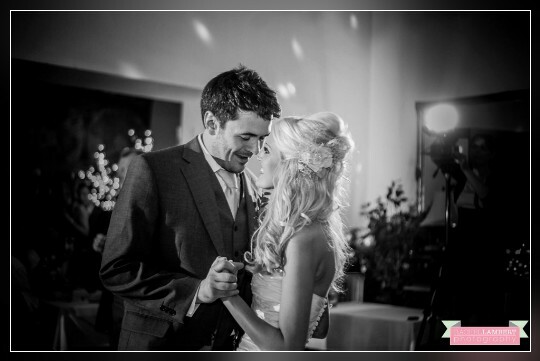 These pictures show you various set-ups by our approved Wedding DJ - Pure Weddings (they only do weddings discos so are specifically set up to cater for weddings). 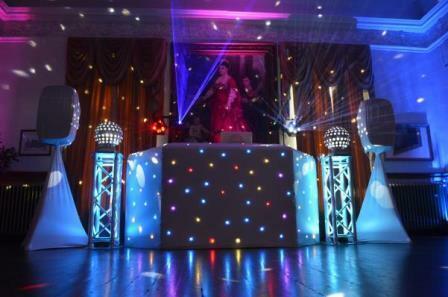 We have negotiated some excellent package deals which are far lower than Pure Weddings standard rates, due to the volume of business the Castle is able to offer the DJ. You can choose a white set-up for the DJ's Booth and Speakers or a Black set-up - the choice is yours! You can even add a White Star Lit LED Dance Floor (not shown). 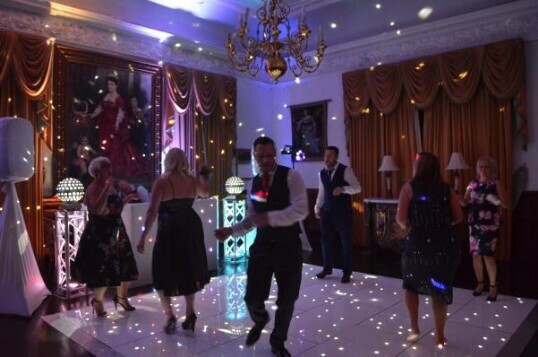 For the LED lit Dance Floor Craig y Nos Brides get an exclusive discount if it is hired with another service from Pure Weddings DJ. 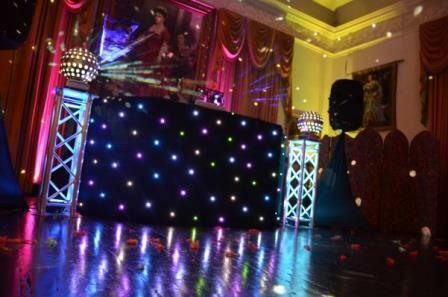 The Platinum package consists of a smart Black or White Pro Star Lit RGB DJ Booth. LEDs are customisable to suit your colour scheme. Red, Green, Blue, Pink, Purple, Orange, etc. Numark NV Professional DJ Music Controller & Backup Denon MC4000 DJ Controller (access to over 15,000 songs) Plus a Toshiba laptop running the SERATO DJ software. I mix live with no aid from the computer. Back up equipment for lights, sound, laptop, decks, van, and full RAC Breakdown cover. Also back up DJs on standby. 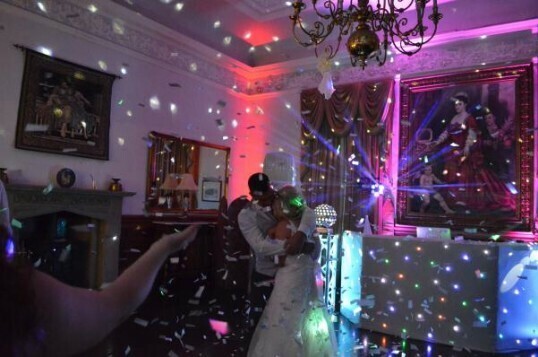 We also supply Confetti Cannons, Selfie Pods, Video, Uplighting, Arcade Machines, Photobooths, Mirror Ball Podiums, UV lights, Moving Heads, LOVE Letters, and loads more. Plus a special SWEEP package exclusive to Craig Y Nos Castle. Please ask for details. 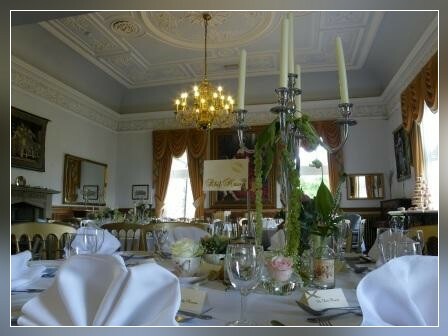 The below pictures show the function room in use as a day room. However most weddings now have their day reception in the Conservatory. Only if you have more than 130 guests for your Wedding Breakfast would you need to use the Function Room for your Wedding Banquet. Note: The Conservatory is no longer used for evening parties except for small weddings where only the Conservatory is hired. This prevents disturbance to overnight guests from the disco as the function room is away from the en-suite rooms so guests retiring early are not disturbed. 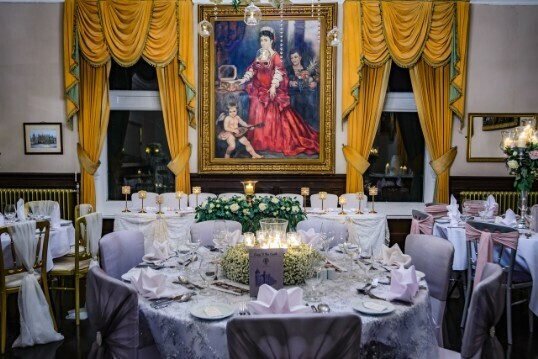 Though the Conservatory took over as the main wedding banquet room following its restoration in 2007, the larger function room is still used for wedding banquets above 130 guests.